Taken on a recent walk. In all it's Glory . What a lovely photo! I remember going to the café with my Mam and Dad in the late 1950s when I was a little girl. You could sit upstairs then and I used to have a glass of fizzy Vimto with a blob of ice-cream in it. When we came out I, along with other children, used to do "roly-polies" down those grassy slopes. To be honest, the atmosphere in the café today isn't worlds away from what it was then, and the memories come flooding back. A different 'slant' from a different 'snapper' - cheerful view too! I once spoke to someone who'd been a sailor and travelled far..he said that Mesnes Park was the nicest he'd ever seen...thank you John,that's a beauty. Mesnes Park is surely a treasure. I have seen many lovely parks on my travels but the crowning glory is surely that wonderful pavilion. The fountain is remarkable too. The gardeners should also be complimented, they do a wonderful job. Thanks for your comments. Yes I managed to dodge "parky" for this quick snap. 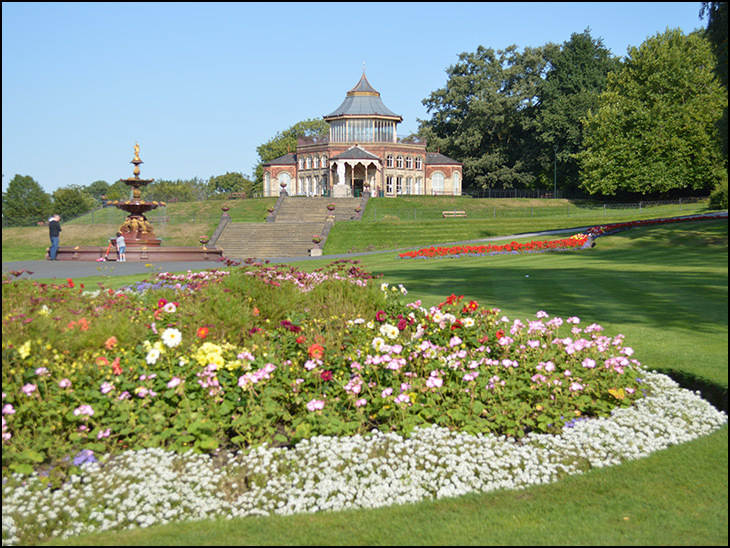 Wigan Park is truly a great treasure to be admired, and congratulations to the gardeners who keep it in such a great condition. Mick, I would check your blood line ! I think Captain Scott may have gifted you some of his DNA . Far and wide has nothing on you . Bet your journals put Scott’s to shame . Lovely, peaceful photo, John. It's a classic.The nicest park that I have ever been in and I have travelled all over. The next nicest park to Mesnes Park is Queen Elizabeth park in Vancouver. Lovely photo John. Does Dave stutter? Brings back memories of when I lived in Wigan and took the kids there. Lovely photo. Must visit that cafe when next on.a visit up north.